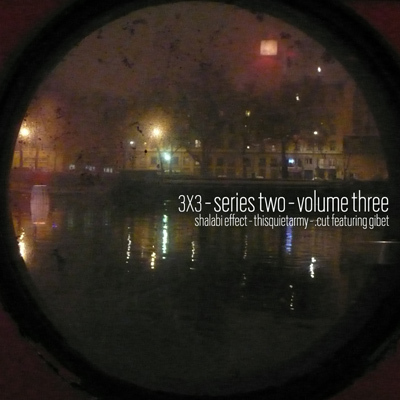 The label [walnut + locust] offers another exciting episode in the 3X3 series of threeway splits. On this gloomy 3″ CDr we can meet Shalabi Effect, thisquietarmy and .cut ft gibet, who together weave a mystical fabric made from brave glimpses spaced out sound, along with the urban dark cathedral music. Under the pale moon and deep in the concrete forest of loneliness, these nineteen minutes of cellar meditation and hypnotic wave will take the listeners on an eerie sight seeing within the alien feeling city. Shalabi effect makes metallic grids shriek with the sound of pain, under a brilliant drone of starlight sounds. Thisquietarmy puts us within the ceremony of static interferences backed by low drones that howl like wind through vast underground tunnels. .cut and gibet take us back into the surface with echoing guitars and vague words that heard across the empty road.